Is it time to potty train your little one? Gather all the necessary supplies before the go live date. Get your child excited about potty training, and take him to pick out the supplies the week before pee day. 7. Potty seat that fits on the toilet or one that sits separately from the toilet. It does not matter which potty seat you chose. My first child was terribly afraid of the toilet, and to this day still hates the sound of public toilets flushing. We used a potty that sat on the floor. It’s less convenient to empty the potty into the toilet every time, but it worked for him. With my second son, he saw his big brother use the toilet and wanted to use it as well. I purchased a seat that fit on the toilet, and he didn’t have any apprehensions. Remember, you and your child can do this! 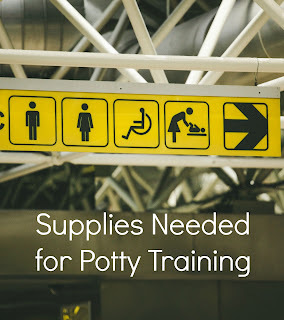 For more information and a complete guide for potty training your little one, check out my eBook here.